"On November 5th, the United States will reimpose sanctions that were lifted as part of the nuclear deal on Iran's energy, shipbuilding, shipping, and banking sectors," Secretary of State Mike Pompeo said today. "The administration's efforts to change Iranian behavior are far broader, far deeper. There are many other lines of effort. We're simply focused on this line of effort today because of the significance of November 5th." President Trump was focused on sanctions as well, following up on Pompeo's comments by tweeting a Game of Thrones-style image of himself with the words "Sanctions Are Coming." If you’re not a fan of the HBO blockbuster, the tweet was a play on the show’s tagline “Winter Is Coming” signaling the arrival of a wintry hell and an ancient race of humanoid ice creatures who pose a threat to every living thing in Westeros. Asked if HBO planned to take legal action, network spokesman Jeff Cusson told CNBC there were "no further steps." A little later, the official White House Twitter account clarified the President’s earlier tweet. Even though Maisie Williams, who portrays Arya Stark and Sophie Turner, who portrays her sister Sansa in the hit show both tweeted their disgust, it should be noted Game of Thrones is itself a show depicting extreme corruption and politics. In 2012, HBO was forced to apologize for a grisly scene in which President George W. Bush’s head was shown sitting atop a barbarian’s spike. "We were deeply dismayed to see this and find it unacceptable, disrespectful and in very bad taste," the cable channel said in a statement. "We made this clear to the executive producers of the series who apologized immediately for this inadvertent, careless mistake. We are sorry this happened and will have it removed from any future DVD production." 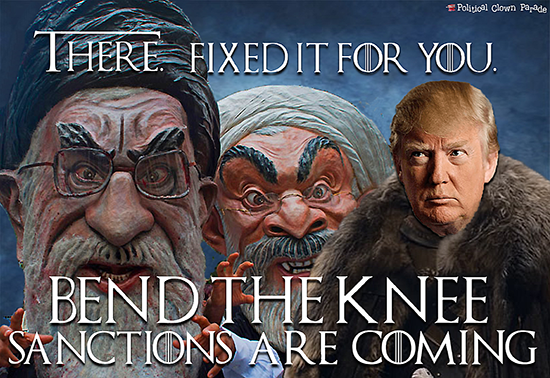 NOTE FROM OUR ATTORNEY: If the babies at HBO assert “there are no other steps” to be taken against the President’s GOT imagery, I guess the only thing I have to concern myself with are the mullahs I pissed off with this Photoshop™. UPDATE: Welcome readers of Bad Blue Uncensored News. We are honored once more by Doug Ross who linked to this post. UPDATE II: Welcome readers of GOP Briefing Room. We are honored by Pookie’s linky-love.